I have a three-year-old who loves to watch cartoons. The good stuff, that is. She's a snub that way, only watching Pooh-cartoons and Cinderella and so forth. But recently, I discovered a Czech cartoon-DVD in my cupboard that I don't even know how I came by. She loves it. And I do too. The animation is slightly naive and old-fashioned, but it's very effective and even touching. The music is great and there is hardly any dialogue, but the added sounds (little children's laughter for example) are great. 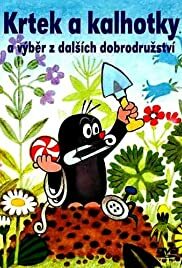 The episode 'krtek me veste' (little mole on the town) is my favourite; it's great comedy, reminding me mostly of Tati movies (especially play time). It's hard to write anything substantial about it, but if you can lay your hands on it, go see it; you'll love it and your 3-year-old as well.